Happy Halloween, readers! Today’s the day when we’re surrounded by images of zombies, witches, ghosts, and spiders- all creatures meant to scare us on some level. 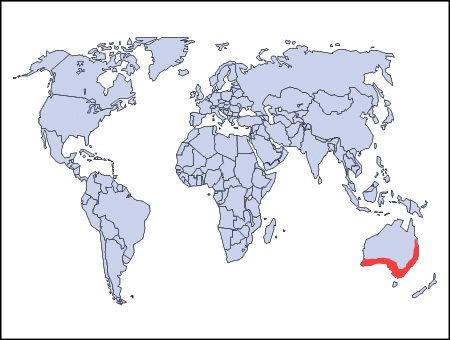 Of course, only one of these things is real. And spiders truly are a scary thing for many people. For all you arachnophobes out there who are feeling vaguely uncomfortable about the preponderance of fake spiders out there today, did you ever wonder what the spiders fear? What keeps tarantulas, the biggest, scariest arachnids of them all, awake at night? Tarantula hawks, that’s what. If spiders had Halloween, this is what they would dress up as. A creature that can kill small rodents being outmatched by a nectar-sipping insect. Sad. 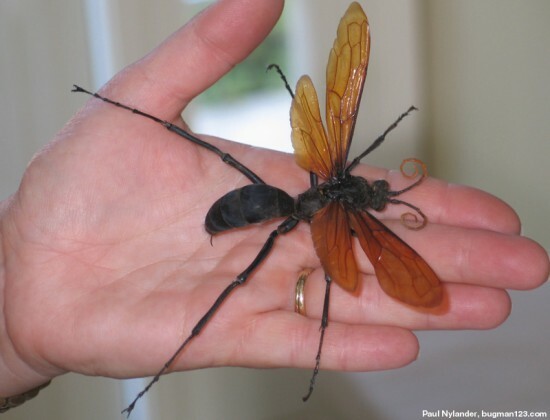 Like any good mother, the female tarantula hawk wants to ensure that her baby has all the food it requires to grow up into a healthy adult wasp. Rather than bag a large piece of prey and have it spoil by the time her egg hatches, she has developed an ingenious system of keeping meat fresh. Spying a tarantula from the air, she will attack, injecting the spider with her venom as it struggles to bite her. A particularly hard and slippery exoskeleton renders this counterattack ineffective; the fangs simply slip off her. Before long, the tarantula has succumbed to her venom and is alive, but completely paralysed. Once the prey has been neutralised, she sets out over land, dragging the spider up to 100m (quite a long way, considering the scale involved) back to the site of a burrow she has dug out. 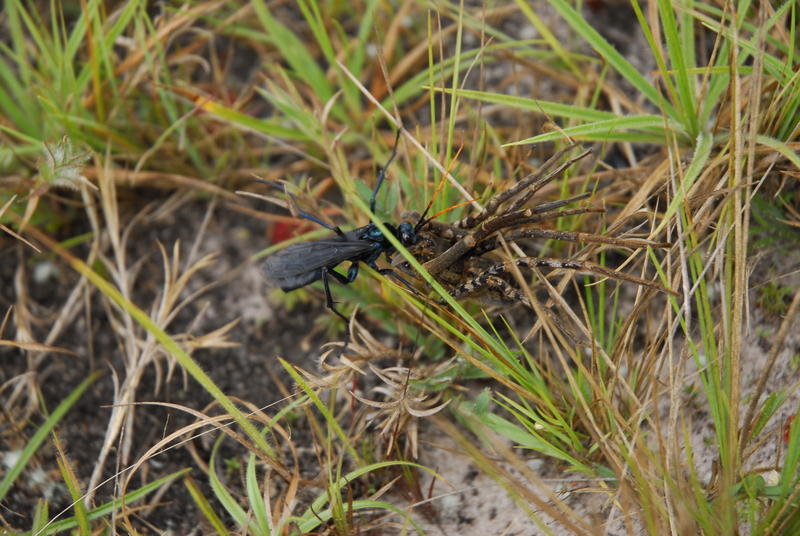 Here, our mom-to-be lays a single egg on the helpless spider’s abdomen, then proceeds to immure it in the burrow. A hundred metres starts to look like a very long trip. But this is only the beginning of the horror for the paralysed spider. Soon after, the egg hatches, and the hungry larva tunnels directly into the spider’s flesh, eating as it goes. The larva instinctively knows to avoid the tarantula’s vital organs as it eats, thereby keeping the prey alive for as long as possible. After several weeks of chowing down, the larva finishes off the job and emerges from the spider’s body, having now matured into a wasp. It then simply unseals the burrow and flies away, leaving the late tarantula in its ready-made grave. In short… don’t touch these. A few words now on just how frighteningly well-adapted this wasp is. Not only is it covered in armour and full of incredibly painful venom, but at roughly the size of your little finger, it’s one of the largest wasps out there, and more of a fight than most insectivores want to deal with. 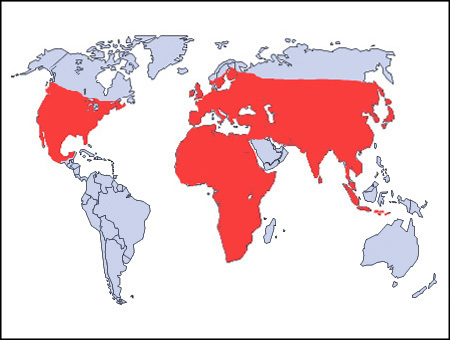 It is essentially without predators. And lest any potential enemies forget why they’re not touching it, the tarantula hawk has both a distinct colour and a characteristic odour, meant to remind aggressors of the pain associated with any previous run-ins. 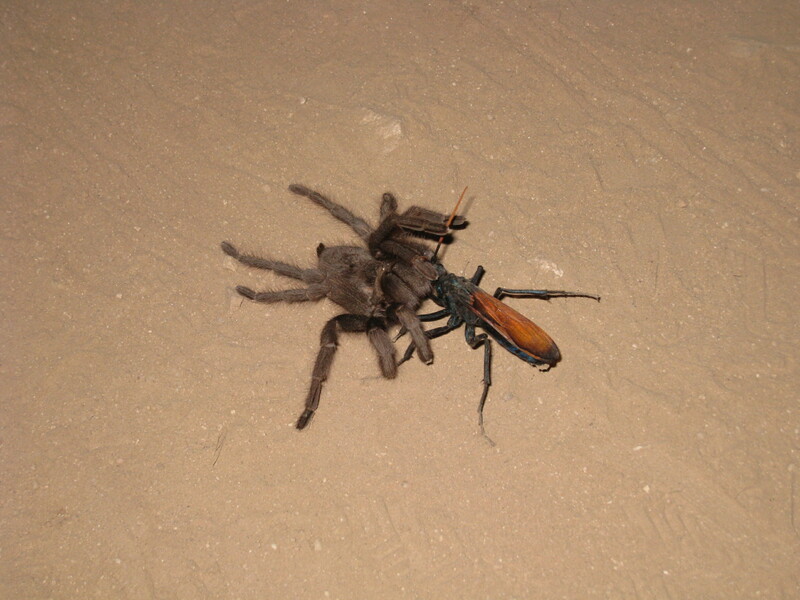 Researchers have described tarantula hawks as being “among the best defended animals on earth” [Schmidt 2004]. And because success always spawns imitation, there are now several other creatures mimicking the appearance of the female tarantula hawk as a form of protection, including the more-or-less defenceless males of the same species. 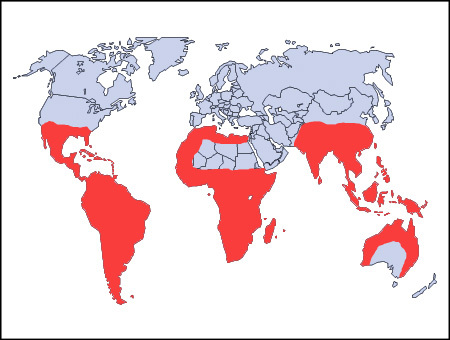 So the next time you shudder at the thought of a tarantula stalking you in the wild, stop and remember what might be stalking it. Quick, what’s the first thing that comes to your mind when someone says “disgustingly inedible” ? 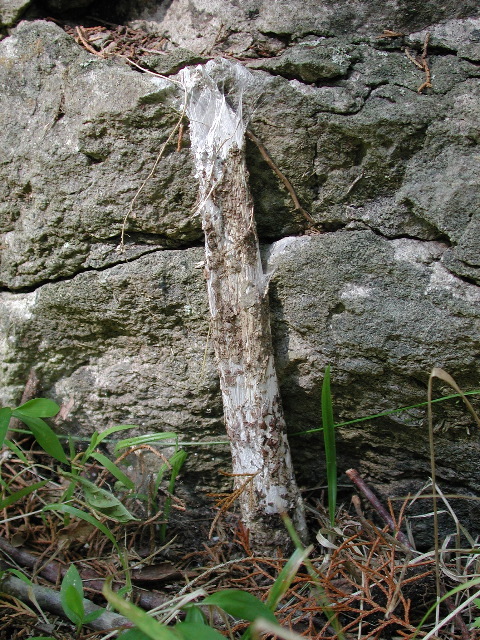 If you said “Why, poop, of course!”… congratulations, you think just like Celaenia excavata. And if the thing you’re trying to look inedible to is a bird, naturally, you go with bird poop. 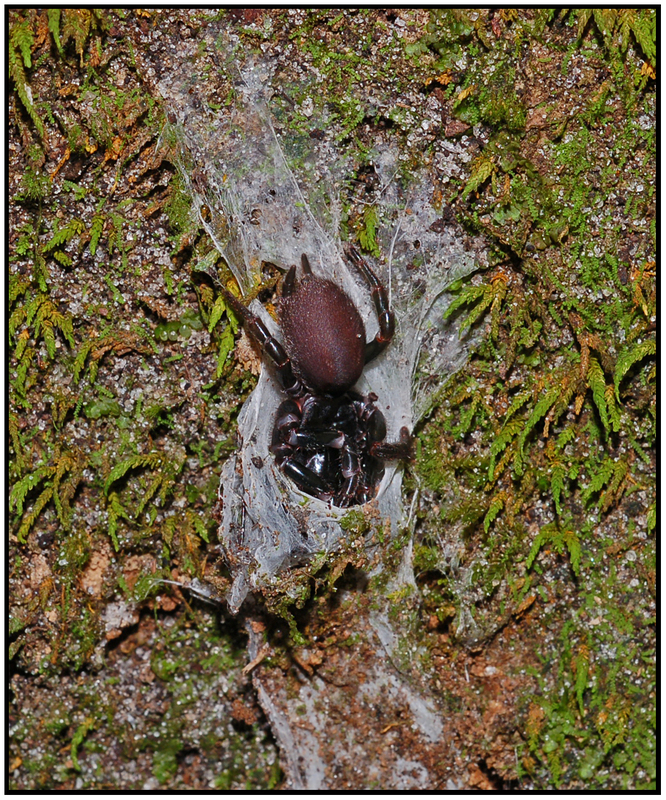 Such is the evolutionary reasoning behind the politely-named Bird-Dropping Spider. And while remaining motionless is a must, looking the way it does allows the spider to sit comfortably atop a leaf all day, secure in the knowledge that spiders’ main predators, birds and wasps (who apparently aren’t into eating bird poop either), won’t take an interest. But the mimicry doesn’t end there for this sneaky little guy- by day it sits inactive and gross-looking, but by night, it hangs upside down from a leaf and releases the mating pheromones of a female moth. When some unlucky male moth comes looking for a good time, the spider snatches it right out of the air with its powerful front legs and wraps it up for dinner. 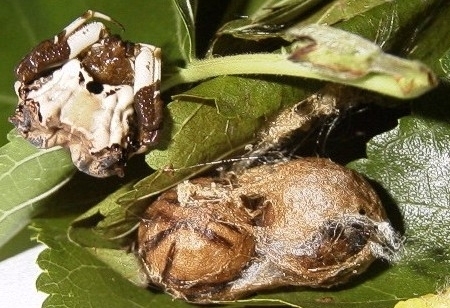 The moth may be eaten right away or, if its capturer isn’t feeling hungry quite yet, be hung under a leaf next to the spider’s egg sacs, which, oddly enough, look like nuts (see top photo). Believe it or not, Celaenia excavata isn’t the only spider out there masquerading as merde. Another such trickster is Mastophora cornigera, a North American species which is part of a group known as the Bolas Spiders, or Fishing Spiders. Not content to hope their prey wanders into arm’s reach, bolas spiders release pheromones to attract male moths, then dangle a line of silk with a sticky blob on the end. 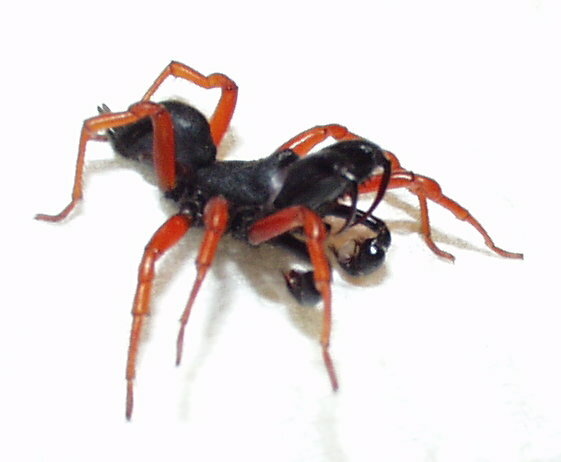 Once a moth gets close enough, the spider swings its line and –yoink– rips the poor thing right out of mid-air. 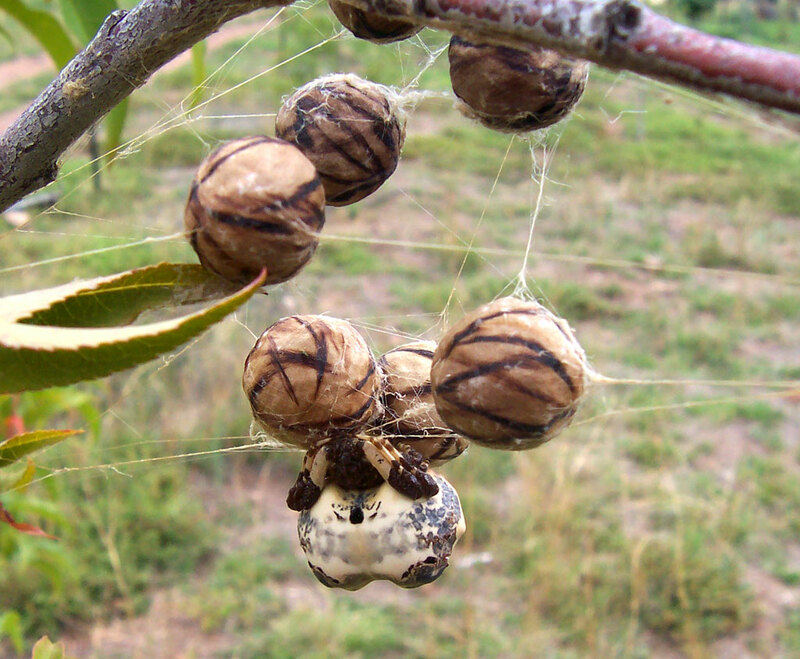 Whoever thought up Spiderman’s web-slinger clearly had a bolas spider in mind. So there you have it, the leisurely lifestyle of a successful spider: pile of poo by day, upside-down fisherman by night.